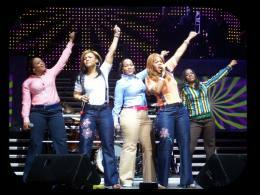 Arguably the hardest working duo in the gospel music industry is the prolific sisterly tandem of Erica and Tina Campbell Mary Mary. The California natives have blazed the world with three well-received full-length releases, countless chart-topping hits, and a significant number of awards to boot. They've captured the hearts of the millions with their palatable message of hope and peace, all stemming from God's love. Currently, the duo is a major part of the Hero Tour, together with Da' T.R.U.T.H. and Kirk Franklin. GOSPELflava.com had the pleasure of catching up with the siblings to talk about the tour and excellence within the industry. "We were kind of unofficially touring," says Tina. "It was like four or five different dates we had and we were both on the same shows. 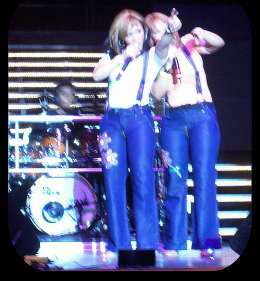 When we were on stage with each other, it was so much fun. We are really huge fans of Kirk Franklin. He has energy through the moon and we do too. So when we get on stage together, there's a natural chemistry between us. He asked us, 'Do you think you might want to go on tour with me?' We were like 'Heck yeah!!'. You don't even have to do all of that asking. Just say you want us on the tour and we're there. What time does the bus leave?!" While there have been many gospel tours over time, the Hero Tour has a unique focus. Read the full concert recap. "The real focus of this tour are the heroes in the small cities that don't get recognized," says Erica. "This is to recognize the unsung heroes who do things in the community for the kids that's free. They have to scrape to find how they will make ends meet to support people in the community. In every city, we've been giving out awards. The local radio stations hold a contest to determine the local community heroes. There's also going to be a contest where we're going to give away a car. We're really just trying to give back to people and let them know that they are important." "The whole 'giving back' term to me is kind of funny," admits Tina. "If you have something to give, you should give it. I think that's just what it is. If you've got money and resources and you know that there are people who don't have it, the God in you, or at least the goodness in you even if you're not a Christian, should tell you that you should try to help somebody. If people think that our words or our presence can make a difference in someone's life, it's our responsibility to show up and do something for someone. As Christians, it's our responsibility to do something to brighten someone's day and let them see the God in us." The Hero Tour stands head and shoulders above all previous Christian tours in terms of excellence in production and musicianship. This distinction is important to the group, as they seek to promote excellence in all that they do. "We've been blessed to have really professional and excellent people around us," states Erica. "These are people who don't just work in our genre. We have input from so many different places, with our producer Warryn Campbell being one of them. He's always pushing us to do more. Then, Tina and I have a desire to make sure that people don't feel like the only time they truly get a concert is when they go to see an Usher or somebody like that. God Bless Usher!! He does his thing. But we're talking about the King, so why shouldn't our stuff be at the same level? And then, I love what I do. I don't want to do anything shabby. I don't care if I did somebody's hair. I wouldn't want to do a so-so, average, just good enough job. I want to find out what are the best products, the best curlers, and the best shampoo. It's the same way with us. We want to have the best choreographers, the best musicians, the best lighting, the best staging. We want to search and seek out how we can make it the absolute best, so when people come they just go 'Oh my God, God's people are doin' it like that?!'" "It's not about us, but it's about who we represent," adds Tina. "I think it's even more important for people who tie God to what they do to be excellent because it's God. What do you think of when you think of God? The Supreme? The Greatest? Why should you be doing something that's almost great and you're representing a great and mighty God? It doesn't make sense for you to come out being, looking, and acting shabby, and half-prepared." "It's over for people going 'Honey, I'm just going to bring what I've got and let God do the rest,'" interjects Erica. "He enabled you to study and find out how to put an outfit together. Do your hair right, don't just pull it back and put grease on your lips. God Bless you if that's what you do but just bring it up a bit." "It's not just about the look, it's about everything," states Tina. "If you're doing something for God, you ought to be excellent. I don't care if you're a preacher, praise dancer, an usher, or a Sunday school teacher. Whatever it is that you're doing, you ought to do it big if you're doing it for God. You ought to be the best at it and I think that is what will help to draw people in to God's Kingdom. For far too long, we're thinking that good enough is enough. You need to do a little something else. You can't wait for God to do everything. Faith without works is dead. You've got to work this thing." The movement for excellence doesn't appear to be lost on the Gospel community, in this duo's opinion. "I do think there is a different mindset amongst a lot of gospel artists," says Erica. "Look at somebody like J. Moss, who does it really big. It's a lot of us that do. I think that frame of mind is spreading because as you do it on a higher level, God will open more doors for you because you're treating it with respect like it's something special. A lot of us are putting more time and energy into the preparation for what we do. It's beginning to show on a level where mainstream America is paying attention to us, our record sales, and our concerts. The fact that two gospel artists can fill up a place like this is big. They don't think, 'Oh we'll just put them in a local church.' Major record companies, producers, and a lot of people are paying attention and we have to do it right. It has to be spiritually right and it has to be right on the business level. We have to make sure that we keep it all together. Now is it easy? God no." "Do we get funding as quickly as the world would get it? Absolutely not," states Tina. "But I think we need to pull together. We need to use our resources and our knowledge. It could be people who know how to write great proposals. We need to use all of these things to expand what we're doing so that people don't look at the Christian community and think that it's always a step behind. It does not have to be that way. People in the Lord's Kingdom have money. Money isn't everything but you need money to make a lot of things happen." "Do you see all them big rings that Vickie Winans wears?" says Erica comically. "God's folks got paper!!" "All of God's folks ain't broke," says Tina. "There has to be a balance there. The Bible says that the poor will always be with you. But God's folks have money. It's time for us to put our resources into what we're doing. You can't just let everybody else who's not representing God be excellent and we're here, representing this great God, and we're always falling a step behind. That's what we try to keep in mind when we approach everything. We try to make sure we're on point. We take care of ourselves. We're not getting any sleep out here. We try to make sure that we've got loads of vitamins and warm up." As the duo has partnered with Kirk Franklin on the Hero tour, they've made some intriguing collaborations recently that continue to keep the duo on their toes and in the forefront. One of those collaborations include gospel's newest sensation, Tye Tribbett. "Tye is just the bomb. He's really cool people," says Tina. "He really means God's business. He's completely humble and highly anointed. He's blazin'!! The God element makes it even that much more phenomenal. Those dudes are excellent. The musicianship, their appearance…. They are innovative and original. And that has a lot to do with it. One thing that I hate about us in God's community, is that we always think that we've got to take something from the world. First of all, the world gets everything they do from us. The people making their music and such get all of their stuff from the Christian community. It's not being broadcast. So we don't need to steal from the devil to make God's thing big. Let's do God's stuff right. And I feel like Tye is one of those cats. He just does God's stuff right. We completely enjoy their ministry and they're tight." "And we're friends with them," states Erica. "After the recording, we all went and spent the night at their house. We're family!!" In addition, the duo has a brand new song with hip-hop legend LL Cool J titled "We're Gonna Make It", which is featured on the soundtrack to Madea's Family Reunion. "Well, we actually didn't work with him, per se," states Erica. "We heard the song. We liked the song. We went in the studio and did our part. I guess they liked how we sing as they called us back and said, 'Sing some more.' So, it ended up being a nice collaboration. Anytime that someone is talking about what we're talking about, it's cool." Without question, this sisterly duo continues to fuse excellence with extreme quality to raise a standard that is second to none in this industry. Check them out on the Hero Tour as it blazes through a city near you.